Like every season at the Hollywood Bowl, this year’s schedule is a celebration of musical diversity, showcasing multiple genres and artists from every corner of the globe. Throughout her career, Nyesha Arrington—she’s currently executive chef at Venice’s sophisticated but very approachable Leona—has melded her multicultural sensibilities with classical French influences. The recipes she presents below, however, demonstrate her ability to elevate even the most familiar American comfort foods. Named after my grandmother, this is a great dish to enjoy at the Hollywood Bowl. It combines a bit of nostalgia from my childhood, when my grandmother would make me sigeumchi muchim, which is similar to a chilled spinach salad. 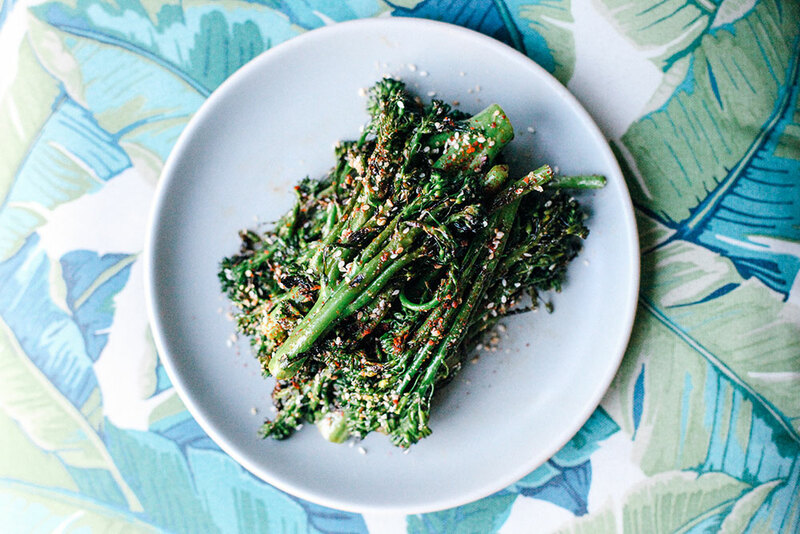 At Leona, we have adapted this into one of our featured vegetable dishes, in which farmers’ market broccolini is grilled and tossed in a light dressing of sweet soy and toasted sesame. Place the broccolini in a shallow dish. Combine soy sauce, sugar, green onion, garlic, sesame seeds, sesame oil, and ground black pepper in a small bowl, then toss in the broccolini. Roast on high heat (425°F) or grill over an open flame about 6 minutes or until al dente. Great lamb always reminds me that spring has arrived, and it works beautifully all through the summer. A light lamb dip served with a natural jus is an amazing, crowd-pleasing entrée that travels well. Remove butcher’s netting from roast and lay flat on work surface. Trim most of the excess fat. Season inside of roast with half of the dried herbs, salt and pepper. Roll roast back up and secure with twine. Combine oil and remaining herbs, salt and pepper and mix well. Thoroughly rub mixture on the outside of the roast. Loosely cover with plastic wrap and let rest on counter for 45 minutes. 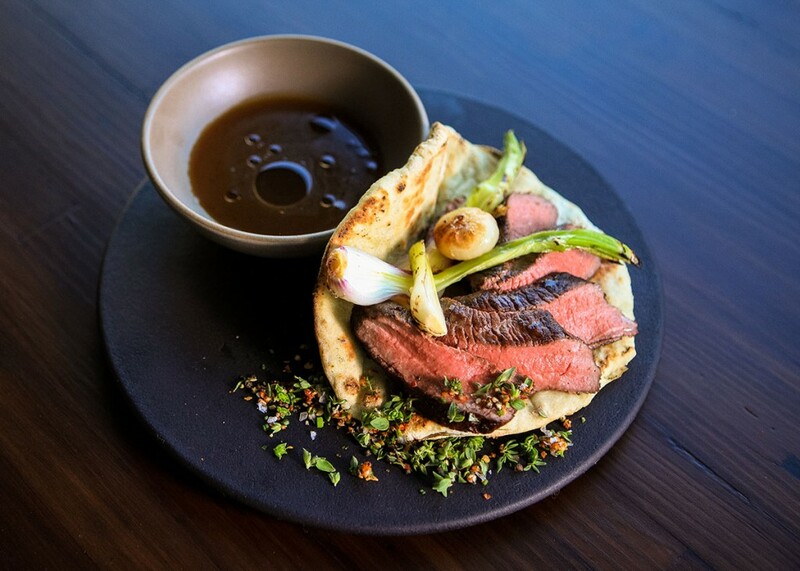 When cooking time is finished, remove roast and place on a cutting board. Remove twine and thin-slice against the grain. Pile meat, and onions onto pita. Serve with side of the natural jus. Preheat the oven to 375°F. Generously butter a 9-by-13-inch glass baking dish. In a large bowl, using an electric mixer, beat the eggs with the milk until frothy. Add the 1⅓ cups of granulated sugar and beat at high speed until the mixture is thick and pale, about 7 minutes. In a bowl, whip the cream with the confectioners’ sugar and vanilla until firm. 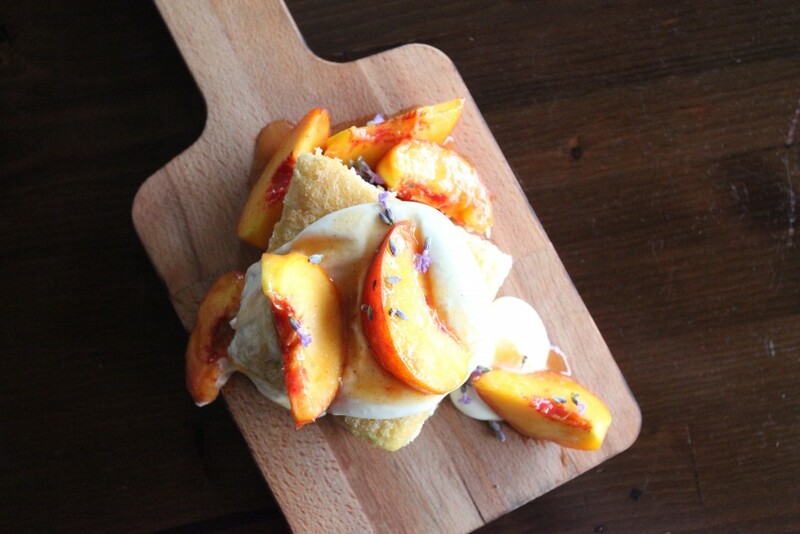 Cut the shortcake into squares and serve with the peaches and whipped cream. Stir in the peaches and let stand at room temperature for at least 15 minutes, stirring occasionally. Meanwhile, in a medium bowl, mix the remaining ¼ cup of granulated sugar with the Cognac. In a medium bowl, sift the flour with the baking powder and salt. Fold the dry ingredients into the beaten egg mixture, then fold in the melted butter until incorporated. Spread the batter in the prepared dish and bake in the center of the oven for about 30 minutes, until the cake is golden. Transfer to a rack and let cool. One of the world’s greatest virtuosos delivers the rich Romanticism of Hollywood legend Erich Wolfgang Korngold, followed by the most famous symphony ever written. Showcasing groundbreaking musical explorations, Mega Nova puts five musical titans together and brings their influential music to life in the epic surrounds of the Hollywood Bowl – a joyous celebration with modern jazz and rock icons alike. Booker T journeys through soul, blues and R&B to open the evening. Since their inception in 1981, U.K. sensation Culture Club has sold more than 50 million records worldwide, led by their classic hits “Do You Really Want to Hurt Me,” “Karma Chameleon,” and “I’ll Tumble 4 Ya.” The original lineup, fronted by the iconic British singer/songwriter Boy George, takes the Bowl stage to perform for the first time with a full orchestra as well as with a 13-piece band.